A SCOTTISH TELEVISION ad promoting safe cycling has been banned after complaints the it featured a cyclist without a helmet cycling down the middle of the road. The Advertising Standards Authority deemed the ad inappropriate, despite protests from Cycling Scotland who were responsible for the ad. 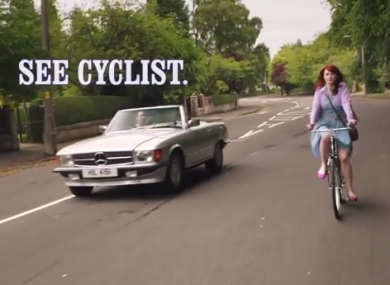 According to Cycling Scotland, the fact that wearing a helmet is not a legal requirement in Scotland was reflected in the ad, as they featured both cyclists with and without helmets. We told Cycling Scotland that any future ads featuring cyclists should be shown wearing helmets and placed in the most suitable cycling position. We can’t help but think that seems a little… obvious. Email “TV ad promoting safe cycling banned for showing cyclist without a helmet ”. Feedback on “TV ad promoting safe cycling banned for showing cyclist without a helmet ”.